The KickPed is a custom Know-Ped, manufactured in the same factory in California, Patmont Motor Werks, but made to a lean and mean customized set of specifications, exclusively for one retail store, NYCeWheels in New York City. In some ways it is less of a scooter than the Know-Ped but the customizers, the people at NYCeWheels, think that what has been taken away from it, improve it. The deck is shaved down to a narrow width, making it easier to scoot without having to trace a wide arc around the side of the board, or steer in a wavy line to get the board out of the way of the pushing foot. The entire front brake assembly has been omitted, leaving only the rear fender “spoon brake”. The simplified folding handlebars come in a choice of two fixed heights, 36 inches and 42 inches, the longer of which allows riders taller than about five feet ten inches to ride comfortably upright without having to hunch over the bars and subject their palms to the forces of the road. Instead of the choice of several exceptionally attractive powder-coated colors of the original Know-Ped, the KickPed’s frame comes in clear lacquer coat only, so you can see the steel and the welds. Now despite these changes representing things that have been taken away, the KickPed costs (at time of writing) $229 plus $34 shipping, a total of $263, whereas a new Know-Ped in any of the four colors can be had for about a hundred dollars less including free shipping if you know how to do a good web-search. But you won’t be spending an extra wad of small bills for nothing. The sellers are very clever people when it comes to knowing what works in an urban scooter, and of course they ride in New York City, meaning we should take note of what they advise. The deck is narrow because the original deck was designed for a pair of side by side feet. The original wide Know-Ped deck is from the motorized Go-Ped, and therefore it makes scooting inefficient because to get the ankle of your propelling foot around the footboard. or to swerve the vehicle around your propelling foot, you really have to bend your supporting leg too much, and that is the most tiring physical action in a kick. I’m sure you have noticed that if you scoot a while and don’t switch feet, it is the supporting leg up on the deck that gets tired, not the one you were scooting with. The original wide Know-Ped deck is beautiful, especially with the bright powder-coated frame protruding at each end, but it’s extra width very much reduces the efficiency of the ride in terms of simple physics. Also the KickPed uses marine plywood, less likely to delaminate if you accidentally get it wet. The front brake is gone from the KickPed because it was the one thing that frequently needed adjustment on the Know-Ped, and it was too aggressive when those metal calipers grabbed the grooved tire-walls, Remember, the Know-Ped is a Go-Ped without the engine, and it’s brakes can stop you from a high speed with a heavy load. The rear brake that spoons around the top of that fat back tire is simply good enough on it’s own, for a human-powered scooter and much less likely to lead to a sudden unintended dismount (accident). NYCeWheels are so frustrated with front brake maintenance that they warn you not to add one to a KickPed or it will void the warranty. The handlebars come in a choice of two non-adjustable heights, and in the case of the custom taller bar option, it allows taller riders to stand upright and watch where they are going, which is less uncomfortable than bending forward to face the road like a road racer, and then bending your neck back so you can see the road ahead through your eyebrows. Remember, an urban kick scooter is not for breaking speed records at the velodrome, it’s from getting to A to B efficiently, comfortably and safely. But don’t make the mistake of choosing the tall model if you are shorter than 5″ 11″. Your hands should be lower than your elbows for good stance. And the clear lacquer coat looks okay also. Very industrial and strong looking. Rolling resistance on smooth concrete, hardwood, vinyl. If you are able to ride your scooter on a smooth surface, then the Xootr will live up to it’s reputation as the smoothest, most energy-efficient, fastest, easiest scooter in the world. It is second to none. On a perfectly smooth level surface, one kick will take a Xootr an unbelievably long way, whereas a KickPed may require an extra kick or two to make it quite as far. But the difference is not as great as other reviewers have written. It’s practically negligible based on my own comparison, switching back and forth from one scooter to the other. However…..
Rolling resistance in the real world. In my normal scootering environment, there are uneven, un-repaired sidewalks, with large gaps and ridges caused by tree roots, lack of maintenance and general disrepair. The roadways, where the cars go, are often almost as bad, and the alleys are extremely degraded and have no hope of being repaired any time soon due to city finances. 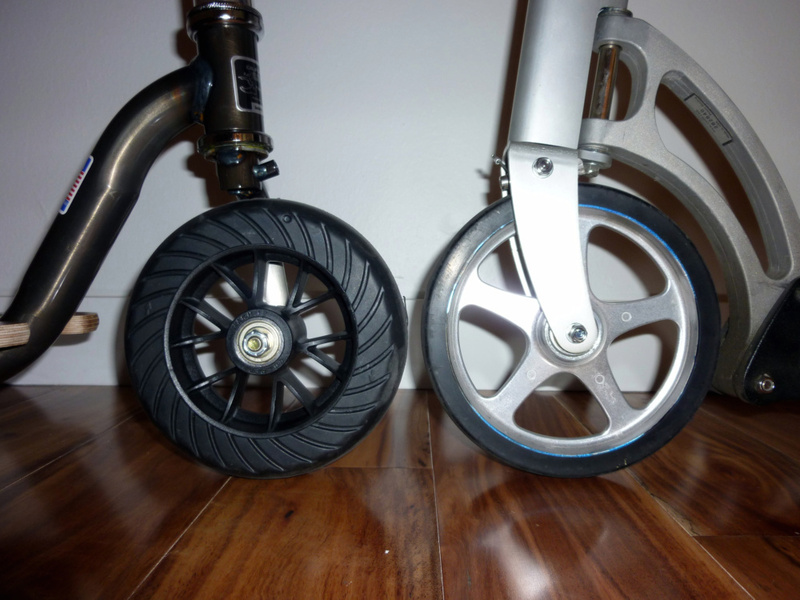 In this environment, the slightly superior rolling resistance of the Xootr is completely lost to energy-robbing vibration and necessary slowing and stoppages, and the rubber-tired KickPed rolls just as far, even further when surfaces get really bad. I am assuming that most people who use a scooter for errands and commuting, as opposed to taking it to a specific place for a pre-planned pleasure ride, will find the same rough surfaces to some degree. 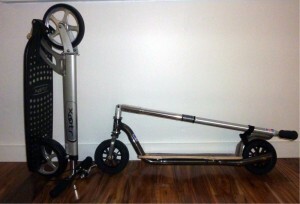 The KickPed can often be ridden when the Xootr needs to be walked. 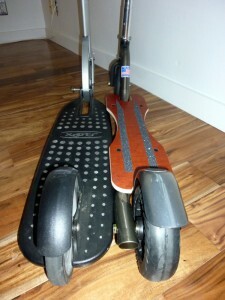 The KickPed’s deck is half an inch higher (3.5 inches) off the ground than the deck of the Xootr Mg (3 inches). If you ride all day, this makes a difference to how tired your supporting leg gets, as you have to flex that standing leg to put your other foot down to scoot. But it’s only half an inch and most riders will never notice, nor will they ride for hours at a time. Some of the large European-style kick bikes have very high decks that really cause this fatigue, but the KickPed deck is low enough, narrow enough and the grip tape will keep you secure. The Xootr Mg has 1.5 inches ground clearance and the KickPed has 1.75 inches. Of course it’s impossible to have both a low deck and high ground clearance, but the extra quarter inch under the KickPed will come in handy on the streets. Also, the bottom of the KickPed is a steel tube. The Xootr’s magnesium rail can behave like a brake pad on concrete and unexpectedly stop you dead if the front wheel drops down onto lower pavement. The KickPed’s wheelbase is about an inch shorter, measured from axle to axle but it does not seem to negatively affect anything. Tires, grip dry and wet. Well this is the big one. If the pavement is wet or even slightly damp, the Xootr can skid and cause an accident. No such issue with the rubber tire of the KickPed. In dry conditions, the polyurethane tires on the Xootr will not let you down, but dampness is all it takes to ruin your day. Polyurethane and water add up to falling down painfully. Not all Xootrs are as noisy as the Mg, but the Mg with a rear fender brake makes one heck of a racket. Constant loud noise comes from the rear brake rattling and also from the area of the “Ergo” quick-release push button ball pin at the front. 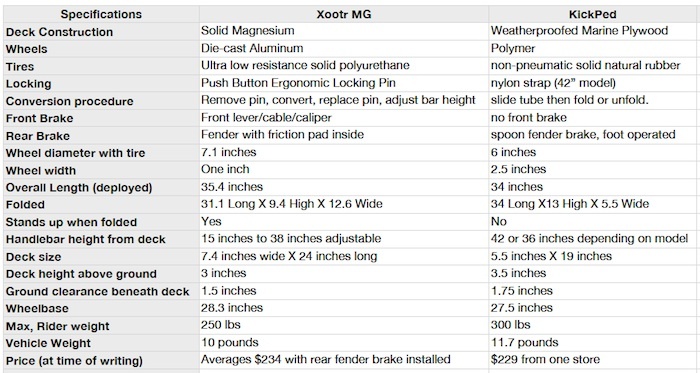 The loud clatter that the Xootr Mg makes on the street is well beyond reasonable. Other Xootrs, like the old ones with the wooden decks, no rear brake and no Ergo pin are quieter but not as quiet as the KickPed. Even in a smooth concrete garage, the Xootr creates this other sound, hard to describe, but most likely from the polyurethane rolling on the concrete. Not a bad noise by any means, but in a comparison test with a super-quiet KickPed, it’s definitely there. The KickPed will rattle a little bit if you deliberately pull and push on the folding handlebar, but for the most part it softly and quietly rolls along without disturbing the wildlife. Be ready to have to warn pedestrians that you are behind them and approaching because they will probably not hear you coming. Riding the Xootr on a rough surface is exhausting. Your teeth rattle and your vision can even blur. This makes it extra hard to avoid a mishap and it’s no fun. The ride on the KickPed is many times smoother. Let’s not get carried away though, the KickPed’s tires are solid rubber and there is no suspension, so it’s hardly ice skating, but compared to the Xootr, the KickPed’s ride does not suffer from undue vibration. The folded Mg weighs a tiny bit less, (hardly noticeable) and is easy to carry in one hand. The folded Xootr Mg can be stood on one end if the handlebar is adjusted to the right height. This allows it to be stored with a small footprint. The folded KickPed cannot stand up on it’s own. Both are easy to fold, but the KickPed is much easier. You just slide the tube that sleeves around the handlebar hinge, fold or unfold and allow the sleeve to spring back down . With the Xootr, the pin is depressed, removed and replaced after the fold, and the handlebars adjusted. It can be hard to line up the pin with the hole if you are holding the Xootr in one hand. But it is not difficult, just less simple than the KickPed, which can be deployed and ridden within one or two seconds of being carried folded up! Both are super durable. Eventually after hundreds of miles, the brakes, tires, bearings etc. may need replacing or at least servicing, but the KickPed is designed to be maintenance-free for life and only very heavy use will require service of any kind. In fact the omission of the Know-Ped front brake is the main improvement here as that was something that required adjustment from time to time. I really think highly of my Xootr but I have to be honest, it is potentially dangerous. Almost every ride includes a scary moment or two where I almost fall or crash or I come to a sudden unexpected stop due to a twig or pebble or bump in the sidewalk. It can also skid sideways on damp pavement and it really is a constant worry that spoils the enjoyment of the ride. Furthermore even on a smooth surface, high speed cornering on the Xootr’s skinny polyurethane tires does not inspire confidence, but they will keep you onboard if it’s dry. In each of these situations, the KickPed just plows through without a moment’s hesitation, without a wobble, and without causing a scare. Any extra input effort required to cover the same distance is well worth it for the peaceful bliss of a smooth and uneventful ride. And on a speedy downhill in a parking garage, the KickPed feels very stable in banked turns. Not so the Xootr. It should be noted here that I generally ride scooters with care from point A to point B, and never attempt tricks besides the occasional cautious downhill speed run. The KickPed wins on safety and on quietness, so these factors alone make it a clear winner for me. Having fallen off my Xootr at low speed due to practically invisible cracks, uneven slabs and debris such as twigs, I am always worried about what might happen on my next Xootr ride. At 54 I cannot recover from an accident like a twenty year old would, and accident avoidance is very high on my list of criteria. And the considerable noise generated by the rattling Xootr only has one advantage, it signals pedestrians ahead to step aside, otherwise the rattling negates all of the brilliant design that went into one of the most widely acclaimed scooters ever made. 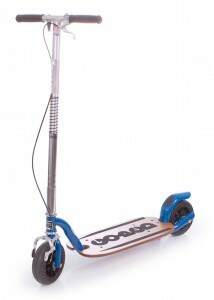 The KickPed is quiet and rolls right over most objects that would upset the Xootr. So what if you own a shiny new Know-Ped and you wish you had found a KickPed first? Simply find a woodworker and shave down the sides of the plywood deck, and then consider removing the entire front brake assembly from caliper to handle, and then you basically have a KickPed in a fabulous frame color, but with the stock 36 inch handlebars. If you are five foot ten or below, you’ll be just fine, and the vehicle’s efficiency will get a big kick. Anyone have the new November 2013 version of the KickPed and can give us the new folded dimensions? I’m really having problems with your measurements vs. nycewheels website measurements. you’re showing 42 inches from deck (you must mean the floor?) as the tall handlebar is 39 inches. You state the shorter 35 inch handle bar is at 36 inches from deck. I’m 200 lbs. 5’10 and 1/2 inches tall and fall in that grey area between handle bar choices. I think the tall would work for me at 39 inches from the top of the board deck, I’d have hands just below my bent elbows and that’s in my socks only. I have short legs and arms compared to a longer torso. Do you have the normal or tall handle bar? Thanks for any advice or a possible re-measurement. I really was glad to find your review article on the web and it came with nice photos. Any updates or product use or recommendations? I no longer have one to remeasure but the footboard was about three inches above the ground so 42 and 36 inches were probably measured from the floor by NYCeWheels. If you are measuring from the deck you can call them 39 and 33. I had the taller one but at 5″ 7″ that was a mistake. I should have had the shorter one. I later had the lower bar on the stock Know Ped and that was a much better height for me. As far as updates are concerned. for a solid wheeled foldable the Ped variants are still the ones to beat. I have stopped using them having now been spoiled by the 12.5″ pneumatic tires on my Mibo. Thanks for the update. Glad to get your 5’7″ height. That helps explain why the original handle bar height would be a better choice for you. I e-mailed NYCeWheels as they’re on holidays until Jan. 8. Hopefully, I get a proper recommendation. I’ll check out Mibo info and reviews as it’s won you over. Thanks for the helpful reply! Looking at the Mibo, the weight and size of even the smallest and lightest make it an unattractive option for me. If I went that large and that heavy, a folding bike would be a better option IMHO. I would hesitate to compare a bicycle with a scooter. In practice they have very little in common. Bikes are machines and get you much further with much less energy, but then you have all the bulk and weight of the bike to deal with when you are done. The problem is that the weight of the Mibo is approaching the weight of some folding bikes. Quite different than the Kickped and Xootr scooters which are significantly lighter and therefor easier to carry around when necessary. You either want to ride a bicycle or ride a scooter. Personally I would never choose to sit on a bike seat and would rather take more than twice as long to get there standing up. Bikes are great if you don’t mind bikes. Personally I dislike the experience of riding a bike. I am just a scooter head. Can I buy the KickPed handlebar with folding system and its great length (I’m 191 cm, so I like this version very much) and use it in typical dirt scooter? As far as I know the KickPed is designed for city scooting transportation, and not specifically intended for jumps, curbs or riding on dirt. But a skilled trick rider could probably do most of the same tricks he or she would do on a skatepark special. Thanks for quick reaction. But what about durability of asymmetrical axes? I’m afraid it can be a weak point of this scooter. No need to worry. The KickPed or Know-Ped axles are stronger than they would ever need to be. They evolved from motor scooters. So the jump from the 15 cm high curb shouldn’t be a problem? Definitely not. You could do that for years and the scooter would probably not suffer. The NEW version of the Yedoo OX seems very promising….and the Mongoose Expo seems like a steal of a deal for its price…. Karen has a Mongoose review in progress over at her website. While the Yedoo is more expensive than the Mongoose, both are much much more reasonably priced than the Mibro. Great post! What a great scooter for city commuters. And it looks like something out of Mad Max! I wrote my thoughts on the KickPed at http://kickscooter.org/the-definitive-kickped-scooter-review. Hope you enjoy. 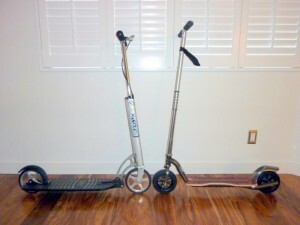 Funny, I just found this review and have owned the exact same two scooters (got both from NYCeWheels). I agree with the review. I ended up liking the KickPed for smoothness and lack of noise, and the wider tires made it safer. I lent them both to my nephew to try indefinitely, and he gave back the Xootr. I might get back the KickPed someday, who knows? Hard to say. Each one is definitely not perfect for one of you. Probably easier for you to have very high bars than for him to bend down too far. I’ve tried both; xootr hands down the best and most efficient. Super lightweight, easy to carry and fast as hell. I’ve travelled to 4 countries with it; stows easily in the overhead. Best customer service and warranty in the world. I’m 52 years old and have zero issues with rough roads; I average 15 miles per day. Thanks, but it is not about quantity and we are not pursuing Google rankings. No-one wants to read filler or AI generated unreadable fluff. Hi Jeffery. I have been thinking of getting a kick scooter for my commuting. I have the concern on its maintenance after many years of usage. Which model needed more maintenance? Did you have any particular issue with kickped e.g. handlebar tear off from the base? It has been a while since I had either a Kickped or a KnowPed, but I’ll always love those. I cannot imagine what you describe. They are built to last for decades. That hinge connecting the bar to the frame is strong. If you want it for free and are in San Francisco you can have it. I’m just too fragile at my age to take a chance on falling and making my spine injury worse. I ordered it from NYC and have the receipt. It’s the taller people version. It can be folded down for carrying around like on the Muni subway system. I’m 6 feet and added a start-up company bell onto the handle bar. I just had an injury before every getting to use it after the wet weather season ended. I have sent Sean Wong your contact email. Hi. Don. Thanks for your offer! I’m sorry to hear about your injury and do take care!